And I love it! I just think that My Favorite Things has the cutest images! I have seen so many beautiful card with them and I knew I needed to break down and buy a few sets! I have only used it once and I am already addicted! For those of you who are wondering why I am straying away from the SU! world so much, I will tell you. I am ready for new stamps and SU! hasn't had any for a long time! Haha. I still love SU! They are awesome. I have just been longing to try new things and let me tell you, it has been a blast! I used the MFT sketch challenge on this card too! I just love how this card turned out! The only thing I hate is the fact that my paper cutter stinks and leaves jagged edges on the paper. A new blade is definitely on my list of things to buy! I do need to take a better picture of this card too. It was cloudy and rainy here all day so the lighting wasn't the best. Well, that's it for tonight! My hubby came home today and his sister is on a date so we are going to spend some QT! We literally have not been alone for the past 5 weeks and my SIL will be here until next week! :( It's ok though. We love her and know she needs us right now! Thanks for stopping by! Have a terrific night! Holy Cow...I mean...Hippo! That's Bright! struggling to find my stamping mojo today and I needed to post SOMETHING! I just can't seem to come up with anything that I really love! I am not giving up though. I will keep at it though...BECAUSE...my new stamps came!!!! :D I was jumping for joy when I checked the mail! People probably thought I was a lunatic. I kind of am. I just don't want them to know that! Hehe. 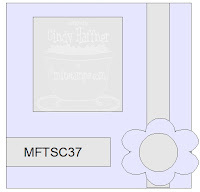 So anyway, I got some new MFT stamps and some new Riley stamps from Hanna stamps! You will be seeing lots of creations with them shortly! :D I was about to go into a stamping depression until I checked the mail! Now I am ready to go! Well, I suppose I should give you the deets of this card. ittle plain. At least I think it is. It's just too busy in the middle and too plain on the outside. Do you agree? I guess that's all I have. nt card...right? Ok, that's all for now. I promise I will be back with a much more lovely card! *I will not be responsible for any eye doctor bills that result from looking at this card too long. **I am also sorry for the lameness of this post. I don't know what's wrong with me today! Well, have a TERRIFIC Sunday afternoon! Later this evening I am going over to Leanne's to scrapbook! I have only ever made those 2 scrapbook pages so I hope things go well! Hehe. I am sure Leanne will teach me everything she knows and I will come home a pro because of it! She certainly is talented! I'm gushing, but I'm being honest! Take care! I did it. I gave in. I am posting another card. Do you ever have that card that you just can't wait to post? Both this one and my Howdy card are cards I couldn't wait to share with you! :D This is another stamp that I ordered from Lizzie Anne. Isn't it cute??? I realized, once I joined Taylor's Cupcake Challenge team, that I did not have any cupcake stamps so I decided I needed this one! For $4.99 too! You can't get much better than that! I am just so excited that I found them! They have the most adorable stamps for a really good price! For this card I used a Lizzie Anne sketch. Every Monday, one of the girls posts a sketch challenge on the Lizzie Anne forum. This week's sketch was a little tricky. I had to do a lot of thinking before I knew what I wanted my card to look like. I am loving the border on this card. At first I was just going to stamp the sentiment once but I didn't stamp it quite where I wanted so I decided to see what it would look like if I stamped it as a border. I LOVE how it turned out! I also added the paper piercing as a last touch. It's a little crooked, but I think it was a nice addition. Oh, I would also like to mention that I did my first paper piecing EVER on this card. I am not sure if you can tell but the cupcake cups are dp from the My Mind's Eye set that I bought this week. I love the look that paper piecing can give an image! It is easy to do too! Well, that's all I have for this card. I used my SU! Markers to color the cupcakes. Just in case you were wondering. Have a fantastic night! I am going to go pick out a movie. Not sure what yet. It's not near as fun to watch a movie by yourself. I am so ready for my hubby to be home! :( I miss him like crazy! Thanks for stopping by! I will be back tomorrow after church! Hehe. Don't you just love this little guy? I do! This is another stamp that I got from Lizzie Anne Designs. I needed some little boy stamps and this guy is perfect! I made this card for Jen del Muro's Sketch For You To Try. I kind of cheated and flipped the sketch. My little guy was just too tall! I also used Splitcoast's Inspiration Challenge. Here is the inspiration piece. I haven't done a Splitcoast challenge in weeks! I have really been missing them. Things just aren't the same when I don't get my daily challenge done. Hehe. Alright, a few details on this card. Leanne and I were talking about trying some Copics because we have seen so many beautiful cards where the image was colored. In the past, I have not been very successful when it comes to coloring with my SU! markers. However, I decided to sit down and watch a few Copic tutorials to see what technique people use to get their images to look so gorgeous! Now, I did NOT use Copics on my image. I used my SU! Markers and I think it turned out pretty darn good. Especially for my first attempt. I am extremely relieved to discover this too, because those Copics are ExPenSive! :D If you want, I could try to cook up a little tutorial on how I colored this little guy in. I am working on improving and hopefully it starts to look even better! Any comments about Copics VS. SU! Markers would be greatly appreciated. I am still not sure what makes the Copics better but I would love to hear your thoughts! That's all for now. I might possibly show up again with yet another card. I haven't decided yet. I sometimes like to save my cards just in case I have a day where I don't have time to be creative. We'll see what happens! :D Enjoy your evening everyone! 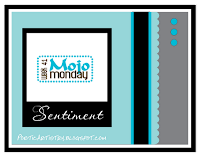 My Mojoest Mojo Monday Card Yet! Because I am actually using Verve stamps! :D I am falling in love with Verve's stamps! They are fantastic! Julee posted a great sketch Monday so I decided to play! For my card I stamped the butterfly on some polka dot paper from My Mind's Eye. Can you believe that this is the first time I have ever stamped on dp? It is! I am definitely a big fan of it! I also added some crystal effects to the butterflies so that they would shine. I really like how it turned out. I just can't get enough of this new My Mind's Eye dp either. I have a feeling you are going to be seeing it A LOT! The same is true with my new stamps too! Hehe. Hopefully you don't mine TOO much. I have to get my money's worth out of them! Well, I have another new card or two to post so I will be back later with that. Until then, have a wonderful day! Along with my new Verve stamps I also got some new Lizzie Anne stamps! I ordered 4 different stamps from Lizzie Anne Designs so I will be showing you more cards with my new stamps later too. For this card I used Jen's del Muro's Sketch For You To Try. I used my new My Mind's Eye paper too. I inked the image up with my markers and put crystal effects in the center of the flowers to add some dimension. Overall I really like this card. I am still not sure about the brads. I think they are ok. Thanks for stopping by this evening! I am home alone this week because my hubby is in PA on a youth trip. I couldn't go on this one because I had my teaching conference. I miss him like crazy! Well, that's all for now! Have a great night! 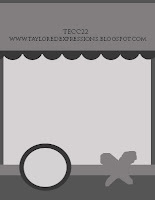 Taylored Expressions Cupcake Challenge #22 & My New Stamps! ETA: I'm going to try and get a better picture a little later. The lighting is not good yet. Yay! Leanne and I got home from our conference yesterday evening and when I went to get the mail I discovered that some of my new stamps had arrived! :D My order from Verve Visual and Lizzie Anne Designs had both come so I couldn't wait to ink them up! Now, Taylor's sketch this week requires an awning so I wanted to create a pretty card. It was hard to choose which stamps to use but I finally decided on my new Fluttering By set along with a sentiment from the Uplifting Phrases set (which happened to be on sale)! I also had to use my new dp that I got from Hobby Lobby this afternoon. I just love the colors in it! To add a little bit of color and dimension I included some fun buttons that I had and covered the butterflies with glitter! I absolutely loved this sketch and had so much fun playing with my new stuff! 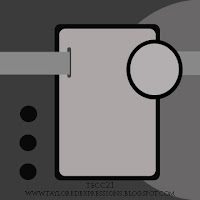 Make sure that you swing by Taylor's blog so that you can play along. Check out her gorgeous card along with this week's fabulous guest designer, Sharon Harnist! You should also check out the other girls' cards as well! You won't want to miss them! Well, I am excited that I was able to get the card posted on time today! I was so bummed last week when I couldn't find my camera. Friday just isn't the same without the Cupcake Challenge! I hope you enjoy this week's sketch as much as I did! The idea of an awning on a card is fantastic (in my opinion). Enjoy the rest of your morning. I will be back later with another card! Two More GinaK Challenge Cards! I made a total of 4 cards for this challenge. I just loved the sketch! :D Another short post today. I promise that tomorrow's post will be longer! Get ready for Taylor's new sketch challenge! :D I am excited about it! I made this card for Gina K's Release Party sketch challenge! It was a lot of fun! Stay tuned because I made quite a few cards using this sketch! I hope I win! :D I LOVE her stamps! Sorry for the short post today! I will be back tomorrow with another card! I got this beautiful card and stamps from my wonderful secret sis! I received these from Nicole! Nicole is in my Blogger's RAK Pen Pal group. I was shocked that she sent such amazing items! The purple card is actually a gift card holder. Isn't it terrific? I just love it! The post-it note holder is gorgeous too! Thanks so much Nicole! You made my day! :D Make sure you check out her blog! I won this blog candy from the fabulous Jenn! :D I have already used the stamps too! I will be posting that card soon! Aren't her cards fantastic though? I was shocked at how much she sent me! I was just expecting the stamps! Thanks girl! I won this amazing blog candy a couple of weeks ago on Brenda's blog! I was completely shocked because this is probably some of the best blog candy that I have ever seen! :D Thanks so much Brenda! Finally, I got this gorgeous card in the mail from Kelly through the SCS Blogger's RAK Pen Pal group. Make sure you check out her fantastic blog! FINALLY! My Card For Taylor's Cupcake Challenge! So...here is the card that I couldn't get posted on Friday! Be sure to stop by Taylor's blog and check out this week's sketch challenge and her fantastic card! I know that the cards needed to be submitted by today if you wanted a chance to win but you can still have fun making a card! This week's guest designer was Tammy from Stamp Happy and you should check out her card! It is fantastic! You should also check out the other girls' cards as well! You won't want to miss them! Thanks for stopping by and for putting up with my absence of cards. I will hopefully be back to my normal programming now! :D Plan on the next 3 posts to be short though because I will be in Denver for a teaching conference! Have a terrific evening! Congrats on your big "mark" (10,000) - I love seeing all of your new work ea. day... so creative. Glad to see you got such a large box of supplies out to your friend Jamie. This is not a good way to start my morning! I have tore the house apart looking for my camera so that I can take a picture of the card I made for Taylor's Cupcake Challenge and I can't find it! Hopefully I can find it or at least get my stupid scanner to work for once! I'll be back in a little bit! I Don't Have My Camera! And I have tons of cards to share today! I have received tons and tons of RAKs in the mail and I need to take pictures of the cards that I have made. However, Nick has my camera. I hopefully get it back by tomorrow! Until then, I guess I am going to post two cards that I made forever ago and haven't shared. I am not sure why I didn't share them. I think it was because they aren't my favorites. I know, I am breaking my own rule. I guess better late than never though....right? I know I used one of Tamara's sketches on the circle card and a Splitcoast sketch on the tall card but I can't find the layouts on my computer and I am really short on time this morning so I will have to post them later. I am so sorry for another short post. Hopefully, starting Saturday, my posts will be a little bit more interesting. Until then, I think you are going to have to deal with boring posts! Sorry! Have a terrific day! This past weekend I went to Hobby Lobby with a coupon and I bought another Changito stamp! :D I have absolutely fallen in love with these guys! Could they be any cuter??? This one is one of my favorites because of how the little one holding the sign is standing on the other one's head! Hehe. Too funny! Anyway, I made this card using the Great Swap Girls sketch challenge. The oval is a lot bigger than I thought it would be but that was the only way the image would fit. I think it's ok. I am glad that I put a scalloped edge around it though. It just adds so much to the card. That's all I have to say for now. I have a ton to do before I go back to where we are staying! I will talk to you all later! Another quick post this morning! I am actually on my way to work but I wanted to post this cute card that I made Sunday! I used Jen del Muro's Sketch For You To Try. I will admit, I struggled with what to use as my image. I think I tried 4 different images before I finally found one that I liked. I also struggled with what colors to use and how to use them. Thank goodness I came up with something that I love. I used a rhinestone brad from the pretties kit to add a little bit of shine to the card. I also paper pierced the corners of the image so that it would look more balanced. Thanks so much for stopping by today! Nick and I are actually on a retreat with our youth group this week. I just happened to not get work off so I am coming in to town every morning. Oh well, I will at least have a couple afternoons and the evenings with them. Enjoy your Tuesday everyone! This has to be a quick post because I am getting ready to head out the door! I made this card for Ashley's Brainwave Sketch challenge, the Verve Visual Inspiration challenge, and last week's SCS color challenge. I am not super happy with how it turned out. I tried combining too many challenges! Either way, here it is! Have a great night everyone! Again, don't forget about that blog candy! You still have time to post a comment! I just loved Carrie's inspiration challenge for this month! The colors in it are just fantastic! I decided that it would be perfect paired with Julee's Mojo Monday Sketch from this past week. I had decided this afternoon that no matter what card I made, I was going to use an image from my Pun Fun set because I have hardly used those stamps at all! They are so cute too! I don't know what my problem is! Hehe. Well, I think that's all for now. Not much to say about this card. The picture isn't the greatest and I wish I would have used whisper white cardstock instead of the very vanilla. Oh well! Have a terrific evening! Don't forget to sign up for my blog candy! I will draw a winner next week! I can't believe it is Father's Day already! It seems like this summer is just flying by! I haven't had much time to relax yet either. Hopefully that time will come soon. Anyway, I want to tell you all just how much I love my dad. I called him today, it had been a while since I had talked to him, and let me tell you just how much I miss him! I didn't realize it until I heard his voice. I have the world's greatest father (imho)! He has been such a huge support system. I can't even imagine what it must be like to not have a father or to have a father who do esn't care. Wow, I don't know where I would be without mine. I talked to him for over an hour today and he let me vent! What dad does that? Haha. He just listened and listened! He knew the right things to say and the right time to say them too! I felt so much better after I hung up the phone, I just couldn't believe it! Let me tell you, I had been having a HORRIBLE day! Anyway, this card is for him. I used Taylor's sketch challenge from last week. I hope you all have a terrific Sunday. Make sure you tell your husband, father, or grandfather Happy Father's Day! I wish I could spend today with my dad.